Contrary to the the DVD+R/RW standard, until now DVD-R/RW drives were produced only by Pioneer; their OEM versions were also available from some other big companies. However, some other manufacturers are gradually starting production of such drives as well. LG was first to make a DVD-R/RW-compatible drive; to all appearances, it used production facilities of the Hitachi's DVD-RAM department LG recently bought. But the new drive is not a pure DVD-R/RW drive as it also can write and read DVD-RAM discs. A bit later Toshiba released a classic DVD-R/RW product without any exotic peculiarities. Production of the DVD-R/RW drives makes the competition on the drive market harder making the prices lower and the DVD-R/RW standard more popular. Although the DVD+R/RW format has better speed characteristics than its competitor, the newly released 4x DVD-R drives must improve the situation. Well, the future of the competition between DVD-R/RW and DVD+R/RW is yet unknown. 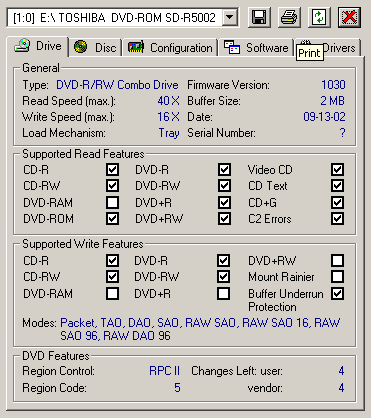 But nevertheless, there are two camps now, one with those who support the combination of these standards in one device (DVD Dual, such drives have started trickling into the stores), the other with those who want to add the DVD-RAM support to these formats (DVD Multi - such devices are still under development). Both directions will release customers from choosing one or another write standard. But now it's easier to buy a device supporting one of the formats. Today I will take a look at the DVD-R/RW drive from Toshiba - SD-R5002. The drive arrived as an OEM version. This model is a direct competitor of the most popular today DVD-R/RW drive Pioneer DVR-104(A04). Its exterior reminds the Spartan features of other optical drives from this company. There is only one button on the front panel - Eject and one LED indicating the status. It doesn't have even a headphone jack. Contrary to the Pioneer's drive, this one doesn't use a fan for additional cooling. Judging by the above characteristics of the Toshiba SD-R5002, it outperforms its competitor in many aspects, especially in operation with CD-R/RW media. However, at present the market is getting involved into the speed race in recording DVD-R, and some companies are creating drives which can write DVD-R discs up to 4x, that is why the SD-R5002 drive can become just a short-lived king. Its installation was flawless. 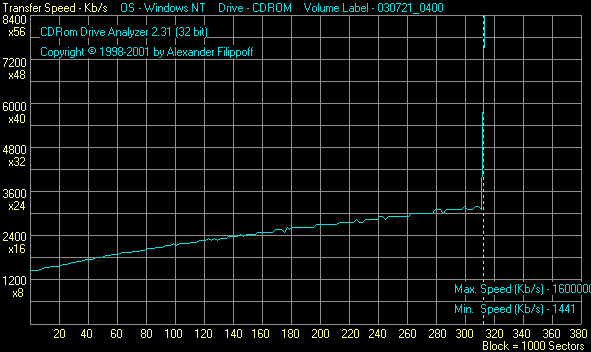 A user is offered a standard procedure typical of CD-ROM drives. The drive doesn't need any special drives. I used NeroBurning Rom ver 5.5.9.14 which successfully detected the drive. 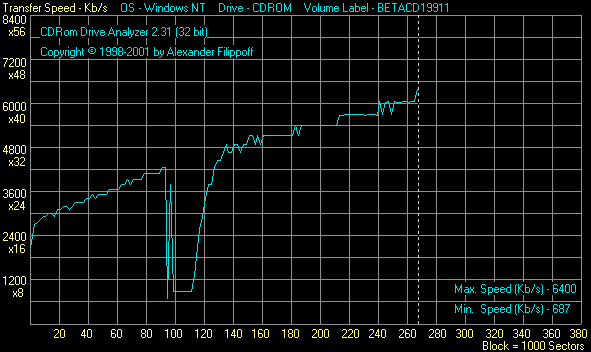 Formats and disc types supported were defined with the Nero Infotool program. EAC showed us capabilities of the drive in operation with Audio CD. By and large, the features of this drive will be enough even for the most demanding users. If you compare it with its direct rival PIONEER DVR-104, the latter will look paler. Now it's time to test all its characteristics. For comparison we will use the test results of the PIONEER DVR-104. The drive offers standard capabilities for recording DVD-R/RW media; it supports 2x for DVD-R and 1x for DVD-RW. This drive offers one tasty thing. The matter is that the PIONEER DVR-104(A04) can record at 2x only those DVD-R discs which passed the Pioneer's certification and are brought into the drive's firmware. The Toshiba SD-R5002 doesn't' have such a limitation. Of course, a user can damage a disc or lose key information when using media of unknown firms, but on the other hand, it's possible to save a lot. Besides, any restriction often produces a negative reaction. In the write tests we used TDK DVD-R47MS and TDK DVD-RW47 discs. Disc type recording time at 1x, min. The test results of the drives are almost identical, with the Pioneer's solution being a little ahead. I also tried to make the Toshiba record some discs which were not certified for 2x and noname discs forcedly setting the record speed at 2x. First of all, I bought 4 discs which differed one from other visually and had different marks on their inner rings. Then I tried to identified them with the ADVDinfo program. Well, according to the program, three of these drives seem to be produced by TDK, while the fourth is coming from Princo. Also, we used two licensed discs from Dysan and Smart Buy. 00 42 00 00 01 40 C1 FD 9E D8 50 00 02 7A 0C 15 .B...@....P..Z.. The contents we used for recording was taken from he pirated DVD-Video disc which is quite big compared to a DVD-R - 4 613 470 208 bytes. Almost all the discs were successfully recorded at 2x. Only the Smart Buy's one failed - it's a pity as it's twice dearer than the "bold" discs. After that I played all successfully recorded DVD-R-Video discs on the Pioneer DCR-111 drive. The record quality was good, no artifacts peculiar to low-quality playback. It seems that it's worth carrying out a practical certification of the discs available on the market so that users can be sure that one or another disc type uncertified for 2x matches the Toshiba's drive. However, I can't say that the Toshiba SD-R5002 lets a user to set a write speed he/she wants. But at least, they can try to do it. The drive reads excellently discs of the competing standard - this is certainly an additional advantage. 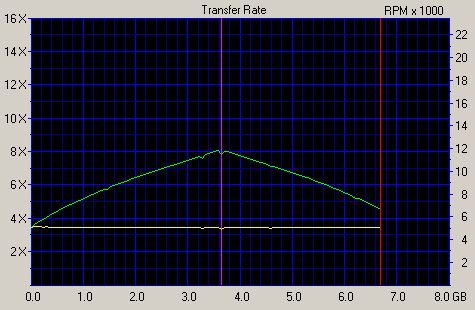 All the obtained parameters of reading of DVD discs of all types correlate with the specification. 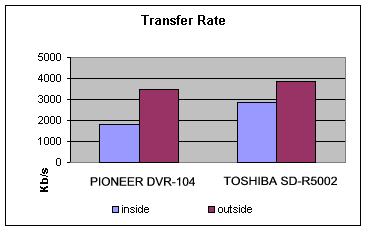 The TOSHIBA SD-R5002 is far ahead the PIONEER DVR-104 in the read speed. For comparison we used the results of the PIONEER DVR-104 drive in the recording tests. Both drives record the discs at 8x almost identically. At 16x the TOSHIBA's drives digs phthalocyanine discs and scores the best results with them. At the maximum write speed of 16x, the TOSHIBA's drive looks much better compared to its rival. Considering that the TOSHIBA SD-R5002 enables the ZCLV mode at the record speed of 16x, we carried out additional tests to find out how this mode influences parameters of the write speed. Well, when the drive likes a disc, it can turn to the maximum speed at the early stage. Otherwise, it records such disc at a lower speed. The TOSHIBA's drive remains the leader in all aspects in operation with CD-RW. The ability of the Toshiba's drive to work with 10x CD-RW media doesn't leave a chance for PIONEER to win. Both drives read and and recorded the 80mm discs quite successfully. The tests were carried out with the device described in this article. The TOSHIBA's solution has the most stable results in quality of recording of different discs. The best results in both cases were obtained with the phthalocyanine discs. Unlike the PIONEER DVR-104, the TOSHIBA SD-R5002 supports Overburn and, I must say, the support is excellent. The drive works confidently with CD discs and carefully processes low-quality samples. The drive managed to copy the 780MB discs flawlessly. Copy time is 7 min. 25 sec. The drive perfectly captures audio tracks. A few errors do not affect the results much or spoil the quality of audio track capture. We also estimated quality of playback of movies on DVD-R/RW on the home DVD player BBK931. The playback was nice. On the whole, the drive works quietly except some cases of operation with badly balanced discs. The thermal conditions are ok. But I don't recommend to place any devices close to it to avoid thier overheating. 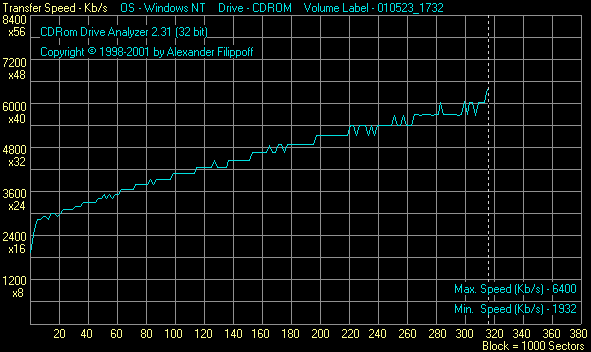 In operation with the unbalanced discs the drive vibrated strongly and loudly. But there were no errors in reading this disc, though the read speed wasn't high. As you can see, Toshiba developed a very good multifunctional drive. It easily outperformed its competitor from Pioneer in almost all aspects. The only downside of this drive is that it came out into the market a bit late, as the market already offers new drives able to record DVD-R at 4x and DVD-RW at 2x. But until the situation with supply of 4x DVD-R media and requirements gets entirely clear, the Toshiba SD-R5002 will remain the best combined solution in this market segment.